Ages ago, cultures around the world kept track of the seasons by giving distinctive names to each recurring full moon. Their names were applied to the entire month in which each occurred. Today we have the advantage of aligning our energies with the cultures we're drawn to, or to the perspective our tradition follows. So if you're of a European tradition, or Norse or Native American tradition; you can pick and choose the name set that you feel most connected to. There are many reasons for different name sets. Cultures, regions of the world, differences in weather, the timing of seasonal changes (such as winter arriving earlier in the north than in the south) and so on. While names from the Farmer's Almanac were largely in use in England and the Celtic lands, these are not the only names in use in those areas. Many people think all Native Americans followed the same traditions and implemented the same names and significance across the board to aspects of life. While there is a large similarity between American tribes and nations, they are not all the same. The Cherokee Nation held different names in part because they governed over the lands of the south from what we know as Virginia south to Florida. While you're doing your own research you might find additional name sets. Try to verify the source of those sets, were they used in a specific region or Kingdom, perhaps they were used in the north, while you might find other sets used in the same culture in the south. Were they Druidic vs. Shamanistic? Or were they influenced by pantheons or altered by other religions that invaded a land and began a conversion. All these events will have an affect on cultural names. The following is a list of a few of these cultural name sets. I'll try to add more as I come across them during research. This by no means is meant to be an inclusive list. Thomas's Old Farmers Almanac (founded in 1792). The almanac is largely based on Europeans who came to the Americas and settled in the colonies. These names were widely used in Scotland, Ireland, England, France and most of their territories. The Deborean Clan is a combination of Celtic and Cherokee cultures. This name set merged names from these two cultures together either by influence or out of a desire to represent both spiritual perspectives. No one is sure when this name set was established, but it's fair to assume it began around the time the Clan itself was established between 1780 and 1800. It's fair to say that Gerald Gardner based his name set on a variety of sources. Wicca itself is a culmination of his previous participations with many craft traditions such as the Fellowship of Crotona, Ordo Temli Orientis and even the Golden Dawn had it's influence on his creation. The Native American nations from New England on west to Lake Superior had their list of full moon names. During this month the wolves once roamed the countryside, thus suggesting the name wolf moon. In cold and temperate climates of the Northern Hemisphere, it was difficult to find food during January, thus the name hunger moon. This is a good time for planning your year from a spiritual perspective. What do you want to accomplish this year. What do you "hunger" for? Set some goals and plan how to achieve them. In certain parts of the world, snow is usually the deepest in this month, thus the name snow moon. This is a good time to focus your magik on home, hearth and family. Because sap rises in March, this full moon is called the sap moon. The ground softens during this month, and worms begin to burrow out of the ground, thus the name worm moon. This is a good time for healing magik. Think of the sap as the blood running through your veins carrying health and healing. Many flowers turn pink and bloom in April, thus the name pink moon. This is a good time for working on potential relationships, or heading off problems in an existing one. Because many flowers bloom in May, after the April downpours, May's moon is called the flower moon. This is a good time for working on commitments, both in spirit and love. Because strawberries bloom in June, this month's moon is the strawberry moon. Also, the French call this moon la lune rose, which translates into English as "the rose moon." This is a good time for taking stock of the year. It's the mid-way point, so review what you've accomplished and what's left to do. Hopefully you'll find reasons for a celebration and put those strawberries and roses to good use. Bucks (moose & deer) grow their first antlers during this month, thus the name buck moon. This is a very masculine moon, so it's a good time to work on the physical things in your life. Either physical in body, or things that some physical attention, like fixing the loose handle on the kitchen drawer. Because it is sturgeon season in certain parts of the world in August, its moon is called the sturgeon moon. This is the month to give thanks. Not only to the Great Spirit, but to yourself too. So set this moon aside for pampering yourself and your family. Your magikal night can begin with a relaxing meditation and a personal reading for yourself. Native Americans began to harvest their crops during this month every year (this full moon occurs late in August and is called the harvest moon). If the full moon occurs earlier in September, it is called the corn moon because the corn crop is ready for picking at that time. A good time clean and clear up the issues of life. A ritual for healing old wounds, emotional and physical, forgiving transgressors and yourself. A "letting go" time. Your harvesting the abundance of your soul and your growth, so get rid of that old stuff and make room for the new enlightened you! The hunting season begins in October, thus the name hunter's moon. This is a good time to align yourself with nature and conducting magikal rituals concerning animal issues, such as finding your personal animal guide, totem or relating to your birth totem. Beaver traps were once set in this month to catch enough beaver to make warm clothing for the upcoming winter. A wonderful time for setting protection and protecting yourself from those 'cold' winds that try to interfere with your personal spiritual evolution. The approach of cold weather in the Northern Hemisphere gives this month's full moon its name. 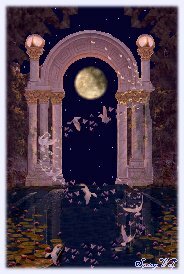 Once again a wonderful moon for turning your attention to home, especially ritual space. The Wolf is the embodiment of the GreatSpirits to Deboreans. The year starts with the outlook of taking the first step of the year on the right path of spirit and along side the wolf. In the south eastern portion of the U.S., February is often the snowiest month. It's often seen as a time to snuggle together around the hearth and share stories, enlightenment and togetherness. The world begins to thaw and the ground is cultivated by the return of the worm in the ground. The birds return and feast the bounty of the early spring. The early spring rains awaken the plants and trees. And bringing forth the renewed life of nature and spirit. The world explodes in color, showing the beauty of the GreatSpirits and the natural world around us. The gardens are bursting with berries. Letting us know life is full of sweet flavor. Moose are extremely rare in the south-eastern U.S. Perhaps for this reason the early Deboreans call this the Deer Moon, instead of the Buck Moon as mentioned in the Almanac. It's the sign of building and repairing one's life, home and spirit. Another diversion from the Almanac, instead of sturgeon moon this month is called the Fish Moon. Rivers and lakes are filled with schools of fish, providing nourishment to body and soul. The early fall is associated with the harvest of orchards in the south-east. Occurring along side Mabon, the 2nd of the harvest festivals it is a time to collect the berries and tree fruits and prepare them for the long cold winter months. It is the sign to prepare life and the soul during the waning year or the end of the cycle of life. The harvest of gardens and fields are in full swing under the Harvest Moon. A special orange glow illuminates this moon just as the trees decorate the world with beautiful fall color. Lending a reminder to take stock of one's winter pantry, life and spirit as the cold winter makes it's way into the year. Early Deboreans supplemented their harvest stores with meat from forest animals during this month. Ensuring their families were well prepared for the barren months of winter. In the south-east, December is the first of the wintry cold months. The fires are blazing day and night, and the warmth of family and friends are kept close at hand. Reminding us all that we are not alone as the year comes to a close. Amid the zero cold and deep snows of midwinter, the wolf packs howled hungrily outside Indian villages. It was also known as the Old Moon or the moon after Yule. In some tribes this was the Full Snow Moon; most applied that name to the next moon. Usually the heaviest snows fall in this month. Hunting becomes very difficult, and hence to some tribes this was the Full Hunger Moon. In this month the ground softens and the earthworm casts reappear, inviting the return of the robins. The more northern tribes knew this as the Full Crow Moon, when the cawing of crows signals the end of winter, or the Full Crust Moon because the snow cover becomes crusted from thawing by day and freezing at night. The Full Sap Moon, marking the time of tapping maple trees, is another variation. The grass pink or wild ground phlox is one of the earliest widespread flowers of the spring. Other names were the Full Sprouting Grass Moon, the Egg Moon, and -- among coastal tribes -- the Full Fish Moon, when the shad came upstream to spawn. This is also the Paschal Full Moon; the first full Moon of the spring season. The first Sunday following the Paschal Moon is Easter Sunday. Flowers are abundant everywhere. It was also known as the Full Corn Planting Moon or the Milk Moon. When the new antlers of buck deer push out from their foreheads in coatings of velvety fur. It was also often called the Full Thunder Moon, thunderstorms being now most frequent. Sometimes this is also called the Full Hay Moon. When this large fish of the Great Lakes and other major bodies of water like Lake Champlain is most readily caught. A few tribes knew it as the Full Red Moon because the moon rises looking reddish through sultry haze, or the Green Corn Moon or Grain Moon. Sometimes also called the Fruit Moon; such monikers were used for a full moon that occurs during the first week of September, so as to keep the Harvest Moon from coming too early in the calendar. Traditionally, this designation goes to the full moon that occurs closest to the Autumnal (fall) Equinox. At the peak of the harvest, farmers can work into the night by the light of this moon. Usually the full moon rises an average of 50 minutes later each night, but for the few nights around the Harvest Moon, the moon seems to rise at nearly the same time each night: just 25 to 30 minutes later across the U.S., and only 10 to 20 minutes later for much of Canada and Europe. Corn, pumpkins, squash, beans, and wild rice -- the chief Indian staples -- are now ready for gathering. Now it is time to set beaver traps before the swamps freeze to ensure a supply of warm winter furs. Another interpretation suggests that the name Beaver Full Moon come from the fact that the beavers are now active in their preparation for winter. This is also called the Frosty Moon, and as this is also the next full moon after the Harvest Moon, it can also be referred to as the Hunters' Moon. With the leaves falling and the deer fattened, it is time to hunt. Since the fields have been reaped, hunters can ride over the stubble, and can more easily see the fox, also other animals, which have come out to glean and can be caught for a thanksgiving banquet after the harvest. December is usually considered the month that the winter cold begins to fasten its grip.